After a busy summer, Barn Owl yurt is safely tucked away for the winter. We make sure to pack both the yurts away to keep them looking pristine, ready for when spring rolls around. We built this yurt frame on a yurt building course with T Fairlove Yurts in 2007 in Dorset. We use locally coppiced wood and shape each piece ourselves using traditional hand tools. To bend the frame we use a wood-fired steamer. The canvas cover was made for us by our good friend Claire. I made the rustic four poster bed frame from some sticks left by a local tree surgeon, and the balustrade from sticks I found by the roadside. This winter we’ve worked hard to maintain and improve the outside area too. The balustrade has been reinvigorated with prunings from around the site. 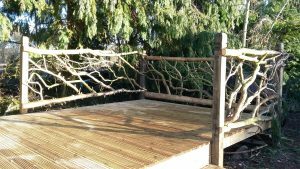 New decking has also been laid down – the old decking was made from scraps of reclaimed wood and had been in situ for 10 years so it was time for something new! We’re also really proud of the new wood archway leading to Barn Owl Yurt. The old metal one was falling apart but had a beautiful, well-established honeysuckle growing through it. We managed to reconstruct the archway within the existing one and them remove the metal piece by piece, saving the honeysckle plant. During the season, when the yurt is in use; there are groundsheets, carpets, cosy bedding and furniture to make the inside feel homely. It’s lit with solar-powered fairy lights and tealight lanterns for a romantic feel! It must be working because to our knowledge there have been 3 marriage proposals in Barn Owl since we opened in 2010. We named the yurt after the barn owl you can often see flying low over neighbouring fields. Since we are keen to promote local wildlife and live a sustainable life; we donate £1 to The Suffolk Wildlife Trust’s Barn Owl Project every night the yurt is occupied. This time of year the winter renovations are well underway; Barn Owl yurt will be treated to some new decking amongst other tweaks and improvements. 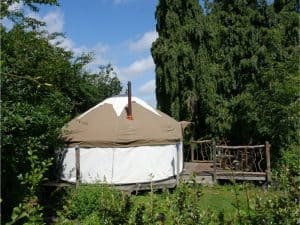 Why not book a stay with us in Barn Owl Yurt this summer? You might be lucky enough to see our barn owl friend while you’re here!